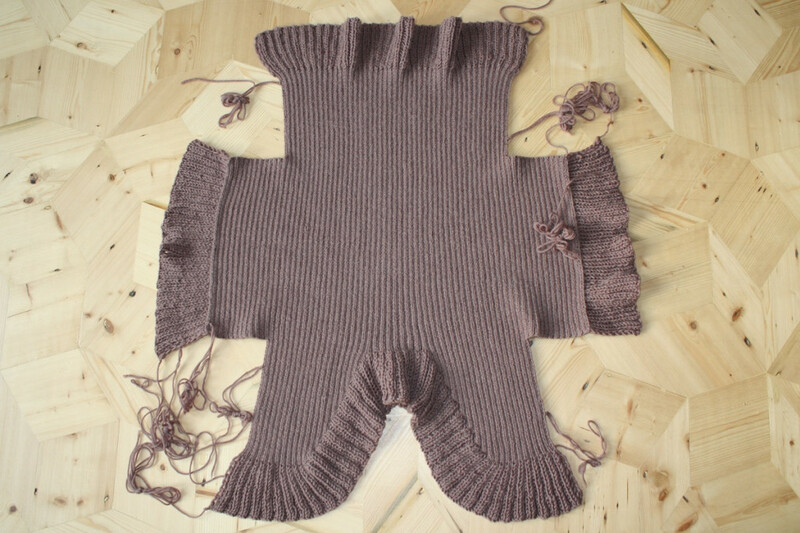 decrease the fronts a bit, pick up some stitches and do the frilly bits, sew up the side and sleeve seams, ok sounds vaguely feasible but not really like the shape in the picture. 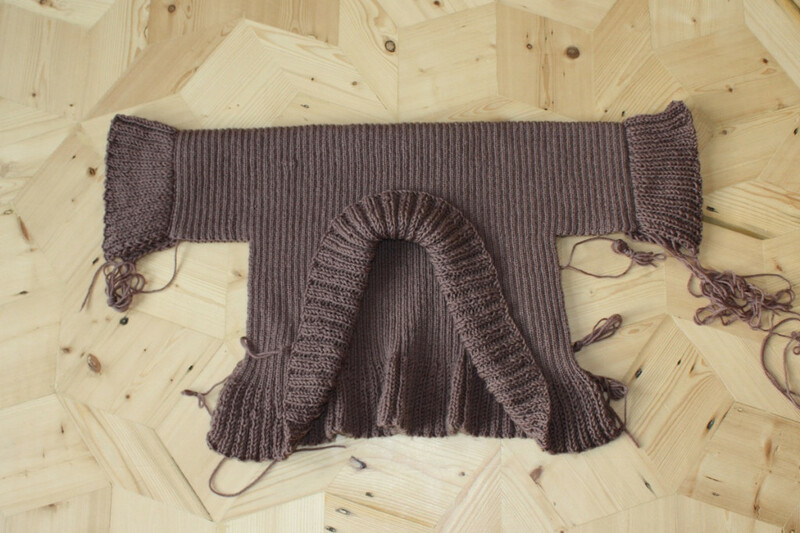 I carried on in blind faith that it would turn out ok in the end and really hoping that I was not going to have to unravel the twelve inches across the sleeves. The images are pinched from www.korthalsaltes.com which is a site run by a Dutch guy who likes shapes and there are loads of nets which you can print out to make pretty shapes, go and have look if you like making things or learning about shapes or both. 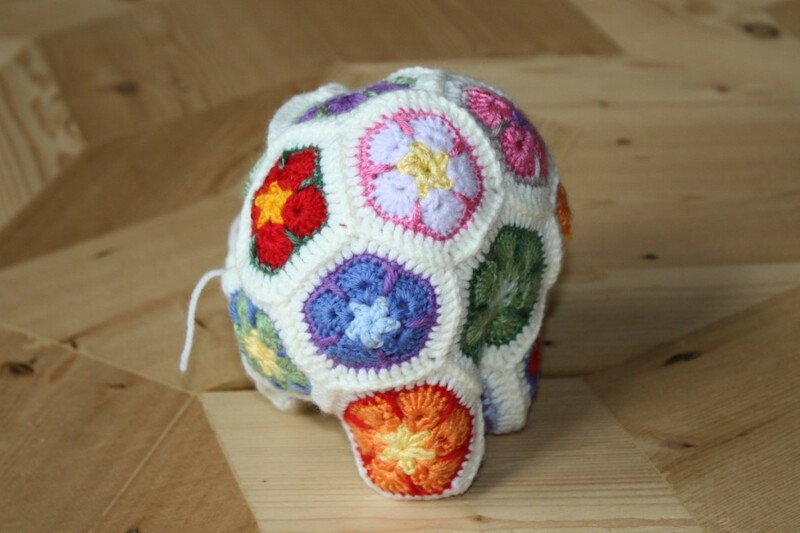 Also if you put ‘small stellated dodecahedron’ into a google image search there is a nice crocheted one quite near the top with a free pattern if you are better with yarn than glue. 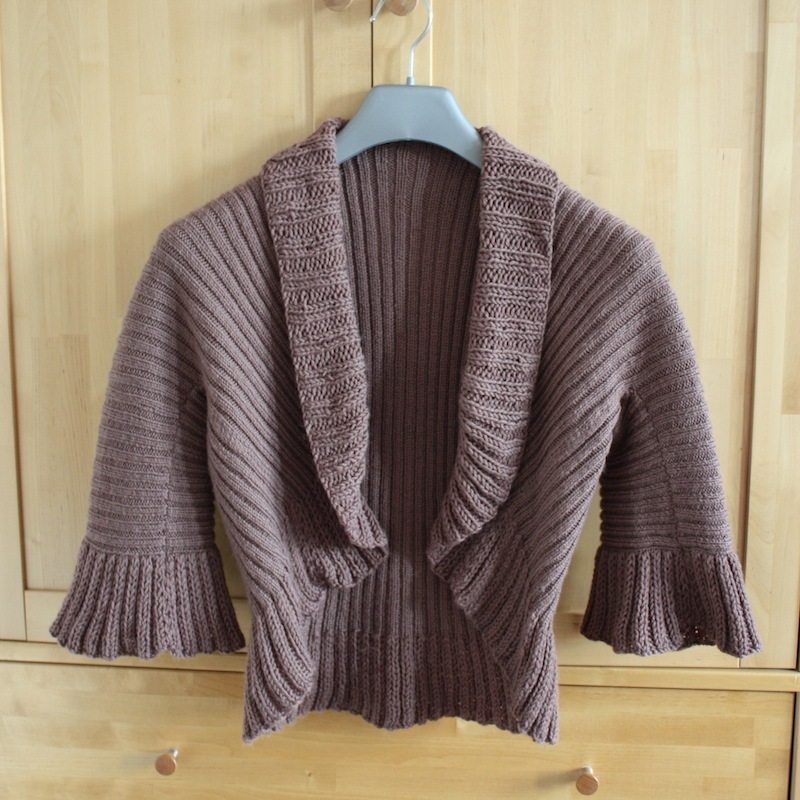 Anyway the point of that diversion was I’m normally not bad at working out how shapes fit together so I was a bit thrown by the bed jacket pattern but I hadn’t taken into account the stretchiness of the ribbing – it can stretch out in some places and bunch together in others which means that when you put a coat hanger or a person into it then the fronts start to curve around, the sleeve seams twist a bit towards the front of the arms and the side seams come diagonally across the front and it goes from looking very square and peculiar to looking the right shape in about one second. This is just a quick update on a couple of things because I haven’t posted anything for a little while, I got all the photos ready and then didn’t do anything with them. I finished the fruit for the tree over the weekend, it’s a little less baked bean can shaped than it was and I think it’s slightly less knobbly. I did enough layers of paper that I could sand it off a little bit so at any rate it is less wrinkly even if still has big knobbles. I’ve just noticed in the photo that most of them have the red side facing out but they are greener on the back. Hopefully they look ok from a distance although I don’t think the little green fellow there will be seen except from on the stage. 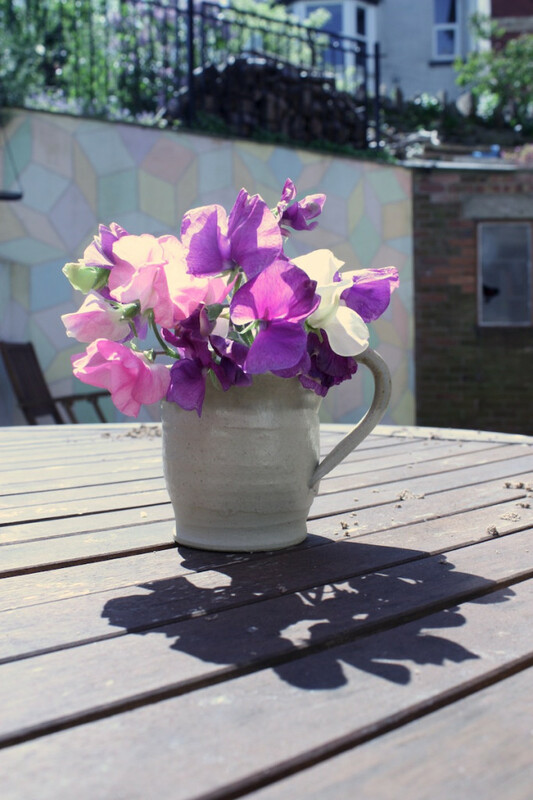 I’ve managed not to kill the sweet peas you gave me in the autumn despite ignoring them all winter in the greenhouse, they are just starting to flower and I’ve got a little bunch of them in a rather nice jug in my kitchen (the photo of it is not in my kitchen but that is where they are now). 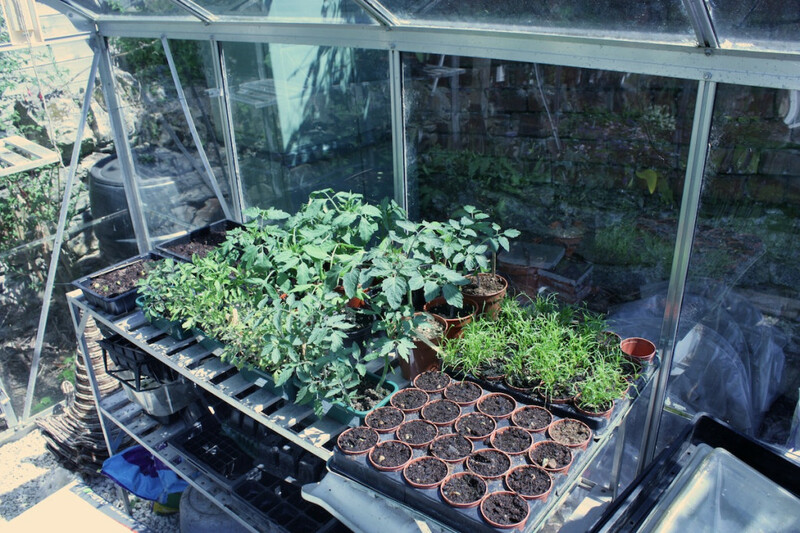 I found some seeds the other day which I had been saving to plant at about half past May and when I found them again I realised most of them said you should plant them in April, so I threw them all in and they are sprouting already to make up for being late. There are some purple dwarf beans (Small chose those), some runners that I saved from last year, some red cabbages and multicoloured courgettes hiding at the back, some tomatoes that need to go into the grow bags, some bonsai tomatoes that desperately need to go in bigger pots and to a new home (does anybody want some small tomato plants?) and some miscellaneous flowers that I can’t remember what they are now (Small chose those as well). There’s some broccoli off to the side where you can’t see it that is going outside tomorrow and some morning glories and sunflowers lurking in the corner next to the lemon tree (also invisible) which produced two lemons this year. 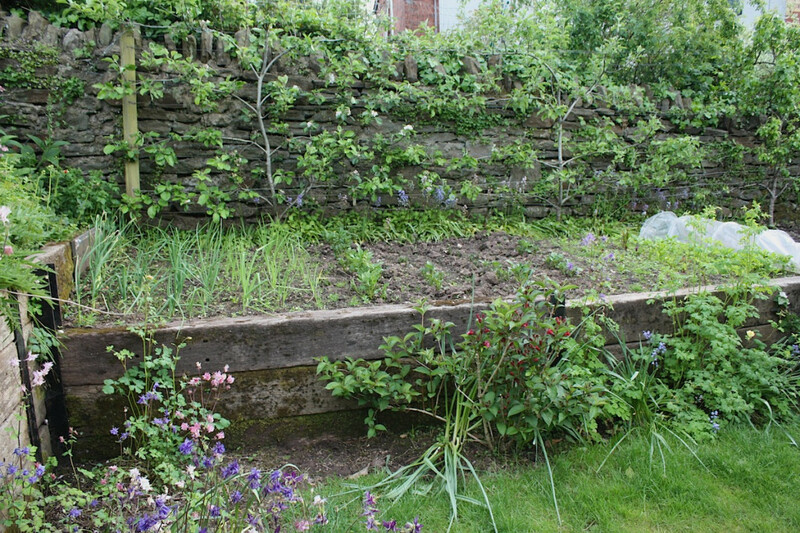 This is the organised bit of the garden which has garlic, red and white onions, Duke of Yorks (or should that be Dukes of York? ), Charlottes, some miserable slug eaten beetroot, far too many parsnips and some carrots (hopefully if they start growing sometime soon). 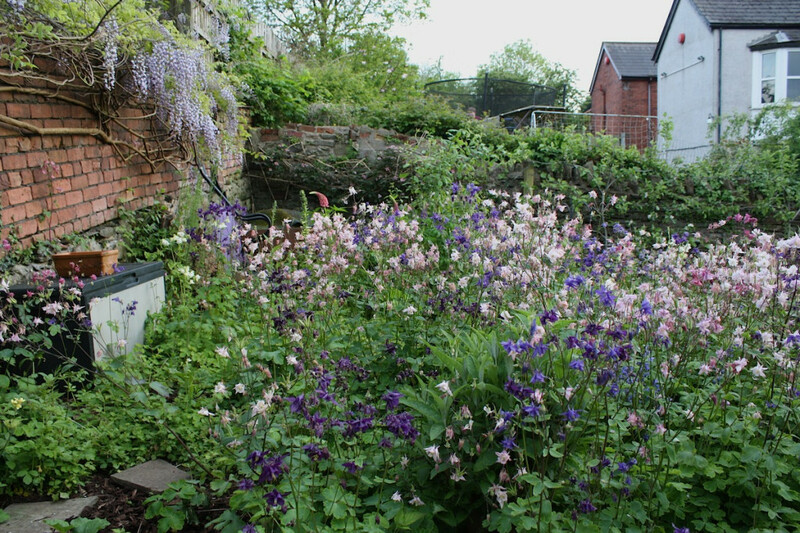 This is the jungle, the wisteria is holding up the back wall, there is a damson (looking a little swamped) and some lupins and foxgloves somewhere in there which I put in last year and seem to have survived, the rest is mostly aquilegias which I have never planted any of (oh, no, wait I lie, I planted some yellow ones over the other side but not any of these ones) in shades of bluey-purple, purpley-purple, pinky-purple, purpley-pink, pale pink and white. They grow everywhere and I love them because of the colours – every now and then they jumble themselves up for no reason and at the moment there is a very dark purple one, almost black like an aubergine, which has pale yellow edges on the bell and then there is one white one which is so beautiful it shouldn’t be called white – if you look a bit closer it is extremely pale yellow, the next time it looks just pink, the next time the palest blue- it is almost pearlescent, the colour of princesses’ wedding dresses in fairy tales or maybe fairies’ pyjamas. And they just grow there with no help. This one’s not an aquilegia, I can’t remember what it is. 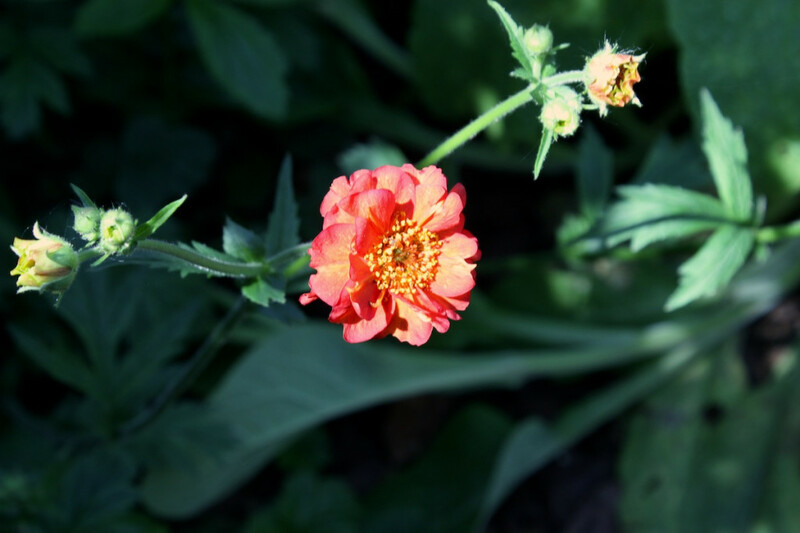 It could be a geum that I planted last year. 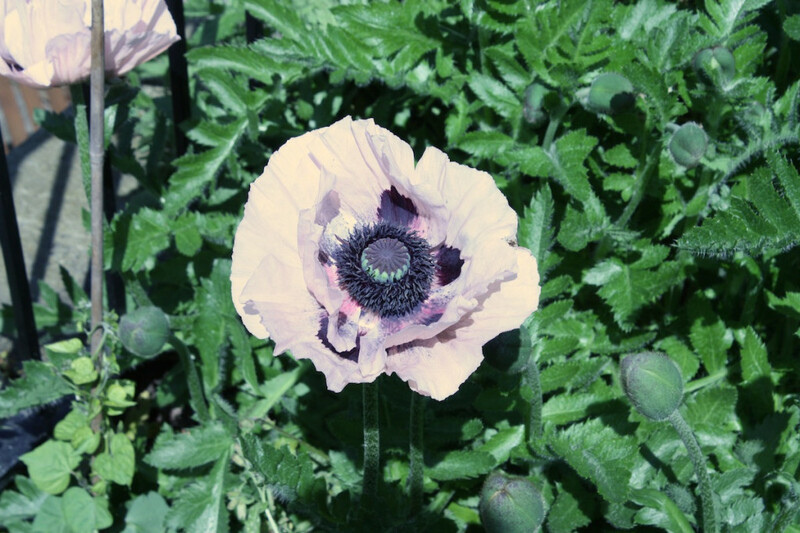 This one is a ridiculous poppy that I don’t understand how it works. I mean how did all that stuff fit into that bud? 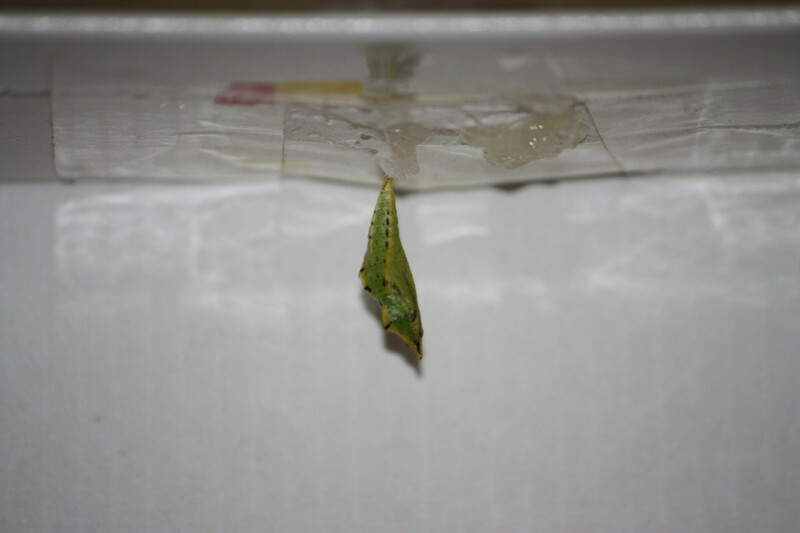 Who has the job of folding up all the petals like butterflies’ wings crammed in a chrysalis? 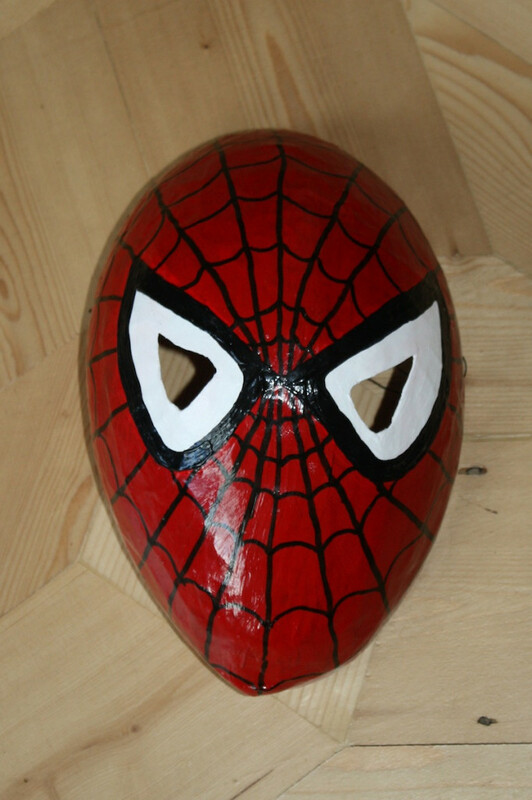 Most of Small’s class seem to have birthdays in May (well, at least a fifth of them so far that I know of) and he wanted to be Spiderman at one of the birthday parties, a friend very kindly found us a costume but Small was adamant that he should have a mask to go with it. After failing to persuade him that face paints would be fine and then failing to find any face paints anyway we resorted to making a mask. Fortunately Spiderman has a more or less ballon shaped head and not too many colours on his face so I did a very hasty couple of coats of papier mâché and dug out some left over acrylic dragon paint. It’s a little bit bendy because I didn’t have time to do more layers of paper and his eyes aren’t quite symmetrical but whose are? And he doesn’t stand still long enough for anyone to notice anyway! While I had the glue out that finally motivated me to get on with the fruit for the tree. (You can read about it here if you don’t know what I’m talking about because it’s too complicated to explain it all again.) That and the kids need to practice with it soon. I know fruit is all different shapes and sizes but this bunch has to be the most knobbly, misshapen collection of not-quite-apples that I have seen for a while. There are a couple of nice, fat, round ones, a few that look a bit too square that I really must do something about and one that looks like one of those weird peach things with no stone that seem to have collapsed in the middle and I can’t remember the proper name for. 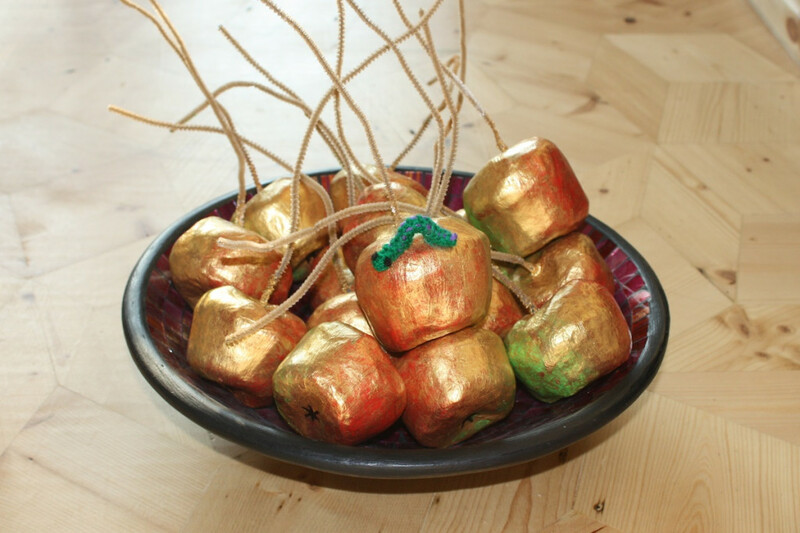 What are the chances that the tree in the Garden of Eden was actually covered with crab apples? There are a couple of golden ones there at the end but the rest need a few more coats of paper first. 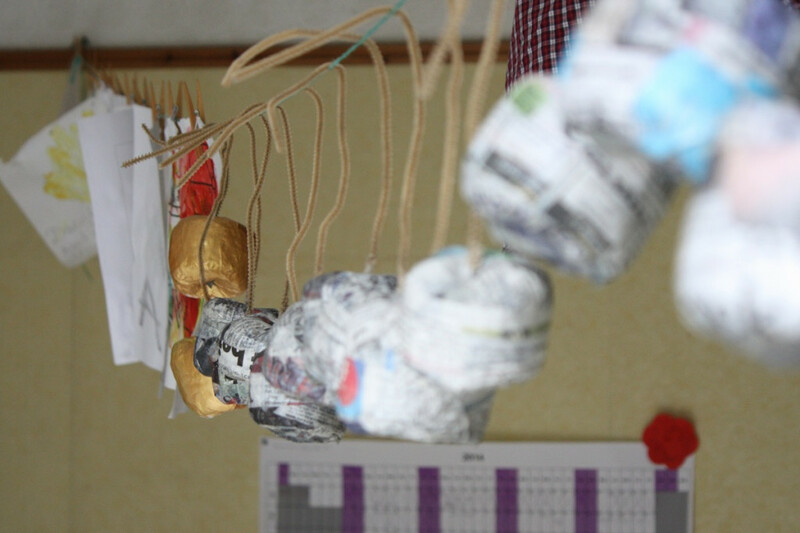 They are hanging up on the kitchen ceiling at the moment along with various small (and not so small) people’s drawings and the washing. I planned out a whole post in my head about how we spent the bank holiday, about the spiders in the greenhouse waging war by hatching out another brood right above the doorway so I got a face full of baby spiders and about how nice it was to sit in the garden, listening to the church bells ringing and making fruit out of bubble wrap for the Magic Tree to wear when it is being the other tree and about how certain sounds (church bells, the shipping forecast and the bit when Radio 4 goes over to the world service in the middle of the night and plays Sailing By and the national anthem) are nice and make me feel like everything is as it should be. 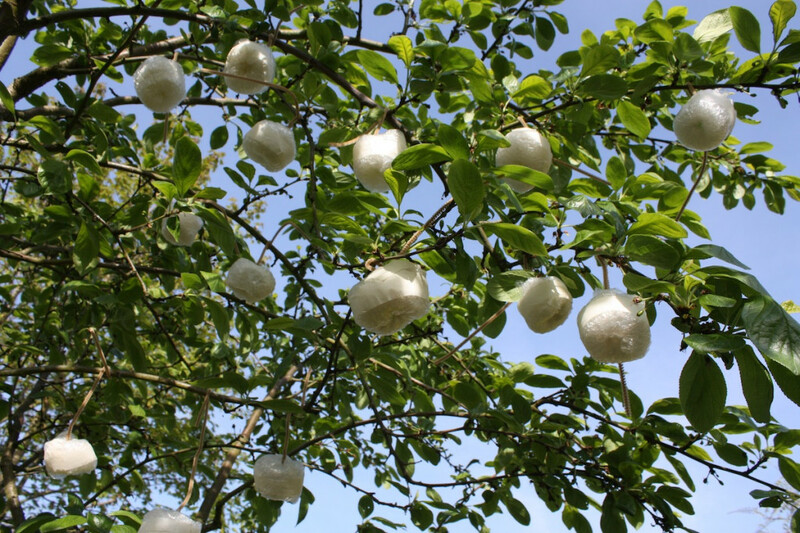 The neighbours now think I am mad (see photo of plum tree with unusual fruit) and I have more or less knackered my long sewing needle by sticking it through too much bubble wrap (the Man in the Shed had to straighten it out for me at least three times before I finished). I planned out another whole post about how I was going to be very good and finish lots of things I had started before I began anything new – the golden fruit I am supposed to be finishing before June, the bed jacket, the Tiny Clanger that I began about two years ago, the enormous blackwork map of old British counties that I finished ages ago and haven’t worked out how to hang up yet, the tapestry for the top of the piano stool which has been nearly finished for ages and ages and ages and just has a lot of very boring plain border left to do, the blanket with the hexagons that I am supposed to be doing in between things to use up lots of multi coloured double knit, the hats I am supposed to be knitting for the shop, the pattern I am supposed to be writing down, the… you get the idea. 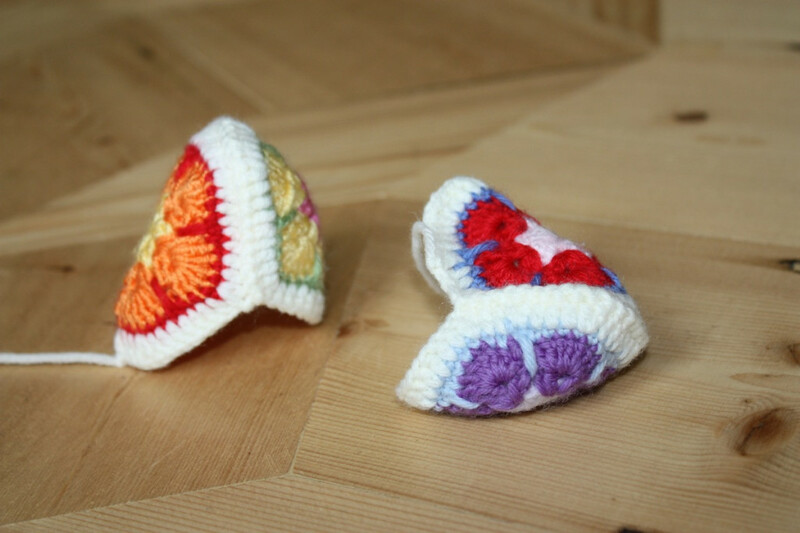 And then somebody asked me whether I could make something or other for the summer fair at church so that they could have a ‘name the something or other’ competition. 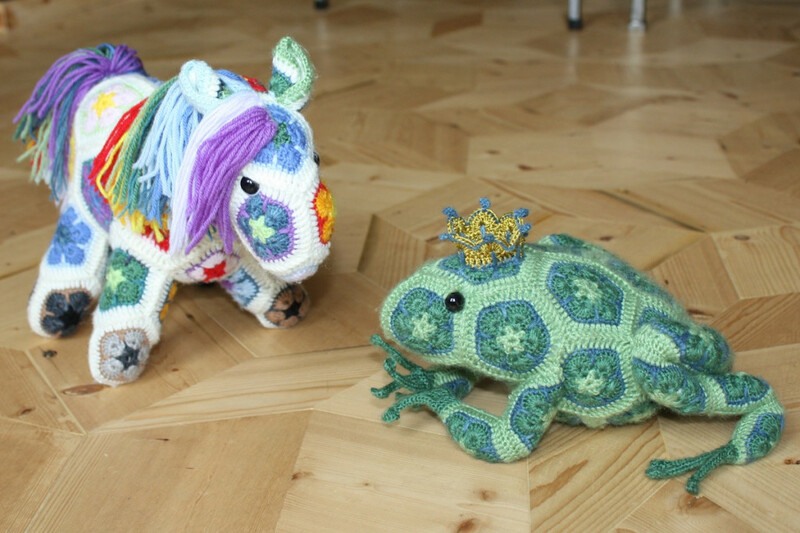 I made a frog prince and a pony for Small and Tiny last Christmas and I thought maybe that was what the person had in mind but I am not very good at making the same thing twice (low boredom threshold – the second one of anything usually never gets started or if it does then it sits in the bottom of a bag for years). 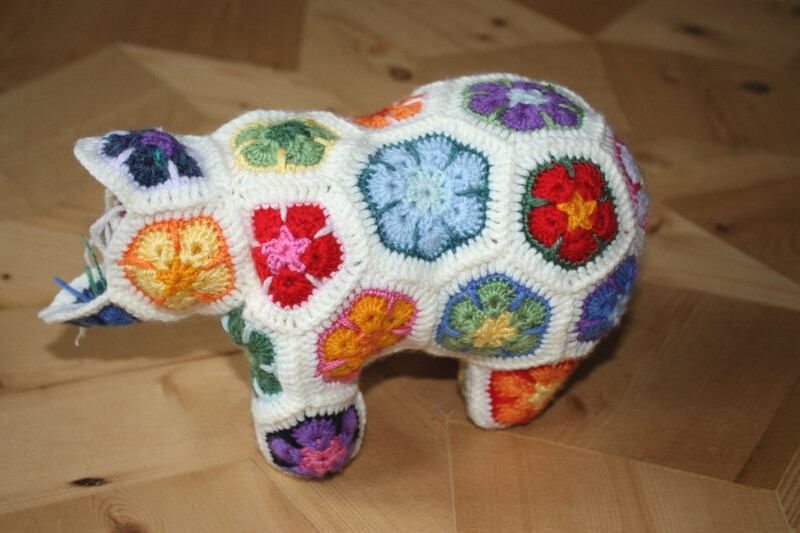 So I dug out the book of instructions that they came from (by Heidi Bears – ooh look she’s done a stegosaurus pattern too!) 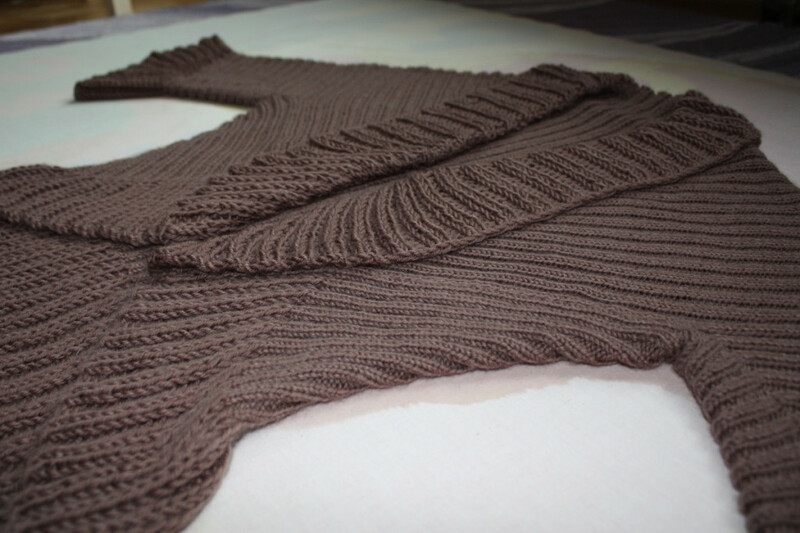 and started making a different something or other (sorry mum, I will finish your jacket before it gets cold again…). 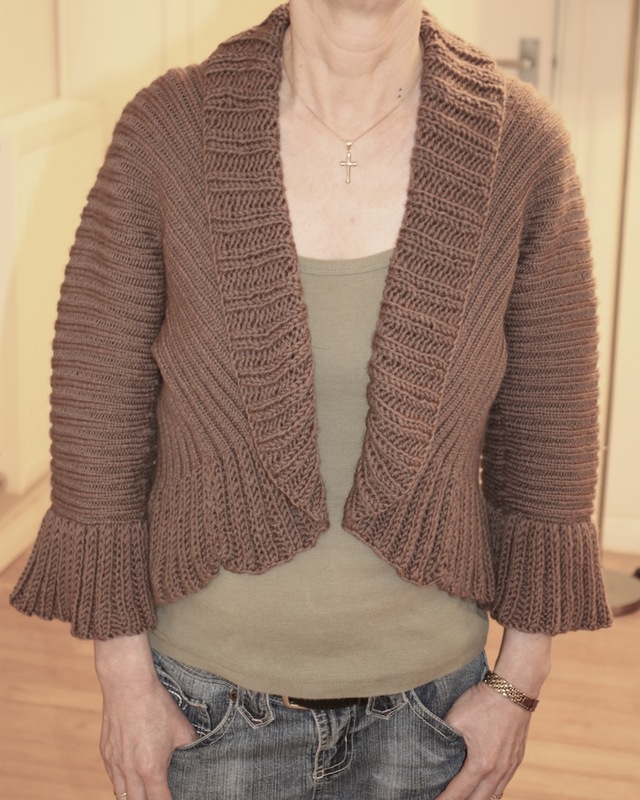 It is made from forty four crochet polygons and the church fair is in the middle of June so I reckon if I do one a day then I should have it finished in time. So far it just has two back legs, can you tell what it is yet? Well here it is in all its mismatched glory, I seemed to be sewing it up forever but it’s finally done. I went for all the different buttons with plants on that were a similar colour, it didn’t seem right to have matching ones on there.